Today, there are more than 6,000 lone soldiers serving in the Israeli Defense Forces. A “lone soldier” is a soldier who has no family in Israel to support him or her. They range from new immigrants, a volunteer from abroad, an orphan or an individual from a broken home. Lone soldiers join all units of Israeli military. Most lone soldiers who enlist in the IDF are highly motivated to serve and protect Israel. Around 30 percent serve in combat units and about 20 percent serve in combat-support units. LIBI USA, which works to support Israel’s defenders in all aspects of life, has launched a new initiative to ensure that those who volunteer to defend the Jewish state and leave home are supported. Joseph Katz, 23, and his brother Alex, 20, grew up in New Rochelle, New York, attending SAR for high-school. 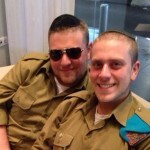 The Katz brothers are both currently serving as lone soldiers in the IDF. With their family in New York, the brothers chose to make aliyah alone, leaving behind their family, friends, and familiarity. They enlisted in the IDF which is changing the course of the rest of their lives. 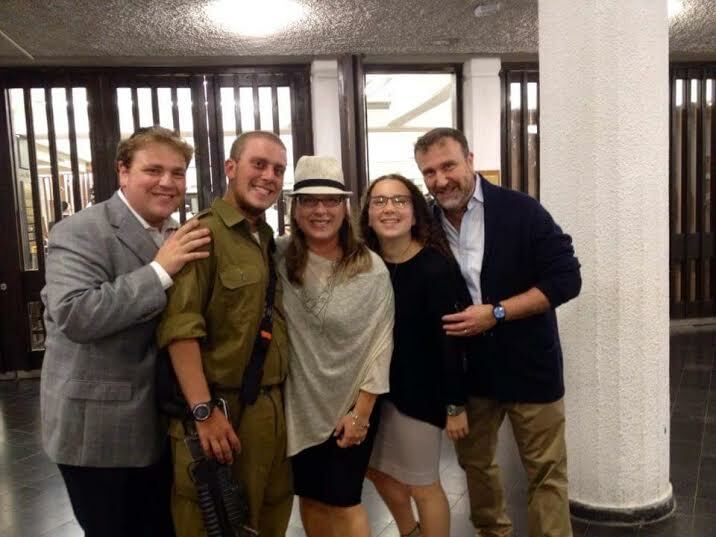 The Katz brothers and their parents, Richie and Gila, spoke with Breaking Israel News and LIBI about their experiences thus far. At what age did you begin to develop a connection to Israel? Joseph: I was connected from birth. It has been the strongest in the past couple of years. My parents have instilled Jewish pride in me since I was child. When I was in third grade, around 10 years old, the Second Intifada began and my father would bring me to rallies in front of the UN and it was then that I realized I had a much deeper connection to Israel, and my importance in advocating for Jews all over the world and especially Jews in Israel. It was from then on that my connection grew deeper. There is a price to freedom. With liberty comes responsibility and therefore I made Aliyah out of my love for the land and my love for what the country has to offer. As a Jew I am completely devoted to the land of Israel and I feel it is my duty to defend that freedom for the entire Jewish nation. Alex: My Summer after 6th grade I went for three weeks to Israel. The first week I spent with my dad. And the second week I was in Israeli Summer camp, one of the only American’s there, and it was during the time of the Second Lebanon War. That Summer my eyes were opened to what an Israeli lifestyle is. I continued to return the following Summers. After high-school, in Yeshiva, I had Israeli roommates and I became a lot more connected to the people, not just on an ideological level but a personal level as well. When did you decide to join the army? Joseph: I decided when I was a sophomore in college at NYU College of Arts and Sciences, that after graduation I would like to move to Israel and serve in the Israel Defense Forces. How do your parents feel about you being a lone soldier? Joseph: When I told my parents I would be moving to Israel after graduation they were a bit skeptical, but as I continued to pursue my dream they understood that this was going to be a reality for me and were supportive of me making my dreams come true. Alex: My parents still struggle with the idea that they aren’t so involved in my day to day life, being that they are so far away, but I know that they are proud of me and support what I am doing. How often do you get to go back home and see your family? Joseph: Over the course of my first year living in Israel I have returned to New York twice to see my family. Alex: In the past year being a lone soldier I have returned to New York once. Why did you chose the unit you are in? Joseph: Currently I am in basic training, which is a six week course. Once I finish basic training I have nine weeks of training to prepare me for my entrance to the IDF Spokesperson’s Unit. Alex: I knew I wanted to go into a combat unit. I chose to go into artillery because I had a nice group of friends that I knew who would be there and be a good support system for me. Why do you feel your service in the army is important? Joseph: I feel that as a citizen I am required to serve in the army. Being that I already have a college degree and a lot of experience in communications for the Israeli Government, I have chosen to contribute based on my experiences and skills and offer as much as I can to the army. I worked at the Israeli Embassy in Washington DC as part of the economic mission to the US. In that role, I worked on financial reports to be given to the finance and foreign ministry and the Prime Minister’s Office, as well as working on the communications team for the Israeli mission to the UN, where I worked on writing speeches on behalf of the ambassadors. Alex: I feel that my way to fight for the Jewish people is to be in the IDF and defend the Jewish nation. I am not only fighting for Israel I am fighting for Jews all around the world. I have not slept a full night in the past two weeks because I have been on missions and this is something that I like to remember which gives me energy to continue what I am doing. How do you look to your brother for support? Joseph: My brother is a commander in a combat unit and he is only 20 years old. He moved to Israel right after high school, and two years later joined the IDF. He constantly is supporting me in my dream to make my life here and I am proud to call him my brother. Alex: I see my brother Joey as a role model. He is an inspiration to what it means to live a life as a Zionist. His passion in life is Israel. Joey was very supportive in helping me discuss the idea with my parents. With Joey’s help I was able to explain to them why I was so passionate about this and why it was important for me to move to Israel and join the IDF. Becoming a soldier of the Jewish state is a tremendous blessing and responsibility that comes with hardships not just for the soldiers, but for the families as well. Richie and Gila Katz, shared with us a personal and powerful story on why their sons’ decisions to become soldiers means so much. Richie: For years, this photo frame has been sitting on the shelf. 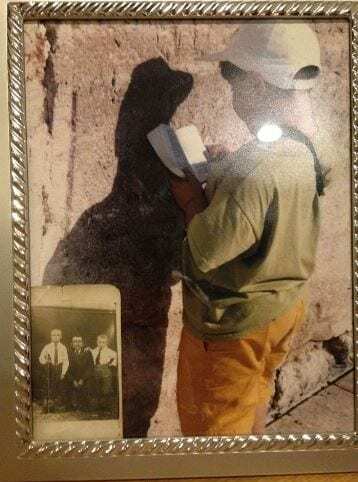 Our son Joey, maybe 5 or 6 years old, is praying away at the Kotel (Western Wall). And tucked away in the bottom corner of the frame, for safe keeping, has been the only photo that the family ever had of my namesake, Yisroel Mandelbam, z”l, flanked by his two sons. Because Yisroel had polio as a child and was physically challenged, he and his family remained in Tarlow (Poland) – either the trip was deemed too difficult for him, or given his handicap, he couldn’t qualify for a visa, or both. Yisroel’s fate was ultimately sealed by the Nazis who shot him dead in front of the family’s home. As we recently learned, the two boys pictured here were taken to Majdanek and slaughtered. I believe with every fabric of my being that the story of Yisroel Mandelbaum’s family could have had a very different ending if there had been a Jewish homeland and, within that homeland, a powerful and compelling voice to speak on their behalf when the rest of the world stood idly by and chose to turn a blind eye to the atrocities of the Shoah. Call me crazy, but as I stared at these photos, my eyes welled up with tears at the realization that housed within that picture frame was the most incredible story of our people’s destiny and a message of hope for the future. That little boy at the Kotel reported for his IDF service, having grown up into a true force to be reckoned with, about to join the ranks of an elite group of men and women who, as IDF spokesperson’s, are brilliantly poised to speak up and send the crystal clear message to this absolutely insane world of ours that never again, under any possible circumstances, will the fate of the six million precious, innocent souls await any Jew, anywhere on the globe. How did you feel when your sons told you that they would be joining the IDF? We are incredibly proud of both of our sons. At first we were worried, but after a lot of discussion with both of them we realized it was absolutely the right thing and with total passion. There autobiographies would not be complete without this decision. As a parent – what do you think your child’s biggest struggle has been as a lone soldier? As a parent I try not to imagine that they struggle. I think they are learning a whole new lifestyle where they are learning that things do not come easy. I don’t believe that they ever truly feel alone, but they did have to become independent very quickly. We know that they are fine but as parents we just want to be there for them. I think I struggle with it more than they do. We have been incredibly fortunate to be able to visit them a few times this past year. We are very grateful that they can share experiences and have each others support. What idea would you like to convey to people around the world about lone soldiers, and specifically about your son? We are living in incredibly precarious times and the state of Israel represents the only change for not only the middle east but for the world for true freedom. Our children are prepared to defend the values that Israel stands for which no other country in the region stands for. I hope that the world recognizes the strength of these kids. They are fighting for democracy and for everyone and of course fighting for our homeland. The sacrifice they are making is not even quantifiable. 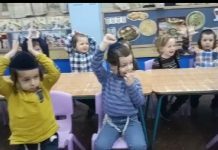 How does it make you feel to know that people all around the world of all different religions, jews and non-jews are supporting your child and praying for them daily? It is daunting. When you know that there are people all over rooting and supporting for your kids there are no words of gratitude that can even express what we feel. Did you instilled zionism and a love for Israel in your home and in your children? We have a homeland where every Jew is welcome and my two sons are doing their parts trying to ensure that that reality never goes away. With big dreams come big responsibilities. We constantly pray that they can both continue to follow their passions and dreams. 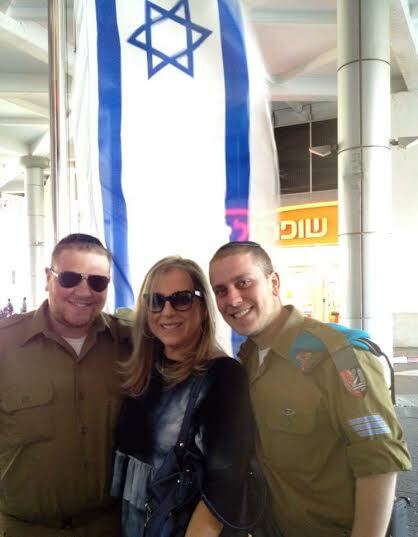 We made sure that our feelings for Israel and our passion for our homeland be passed on to them. “The only thing I do know is that I will be on the first Nefesh B’Nefesh flight after graduation” – Joey said the first Saturday night of his winter break in Freshman year of NYU. Partner with LIBI and the Katz brothers in order to support their mission as IDF soldiers in the defense of Israel. Click here to show your support. Excerpt from Ruth Blau, convert to Judaism, in her autobiography Trail to Truth. More sensitive to spiritual matters than ever before, I was receptive to anything that seemed to open for me a path to truth. 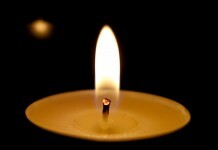 I constantly aspired to get into Judaism proper. Consistoire Judaism did not satisfy me. Nor did the French Mizrachi. The religious zionists in whose Kibbutz Yavneh my son was staying satisfied me until I got to know the fabric of their thoughts and found their thinking and behaviour inconsistent with G-ds demands in His Torah. My past did not contain these elements. Military parades with uniformed participants did not elevate my spirit. I had often seen much more impressive presentations than the Israeli Independence Day parade without being moved more than any Frenchman of lesser or greater intelligence. Marching Israeli soldiers and Israeli airplane formations made no more impression on me than their French counterparts. Could I not see all this in the Champs Elysees? I knew the French military tradition almost by heart yet french military prowess had not kept me from converting to Judaism. Was I to think that the Israeli prowess and its concomitant nationalism would constitute my Jewish happiness? Had I left my father and mother, for lack of nationalism in the land of my birth?